Students at Nelson and Colne College Sixth Form have learnt important lessons about the importance of safe and considered driving at an event run in conjunction with Lancashire County Council. We all know about the dangers associated with driving and the College is keen to raise awareness amongst its students about the potential risks, including what can be done to stay as safe as possible. Therefore, the College was pleased to invite representatives from Lancashire Country Council’s Wasted Lives Young Driver Education Programme to the campus last week. This programme was designed to challenge attitudes and influence the behaviours of young drivers and their passengers, encouraging young people to think about the consequences of their actions. According to the research undertaken by Wasted Lives, 73% of participants in the programme take fewer risks as they understand the potential consequences of risk-taking behaviour. During the event, students attended a workshop where they discussed driving and the consequences of taking unnecessary risks with Wasted Lives facilitator Rhiannon Leeds and PC Derek Brownless. 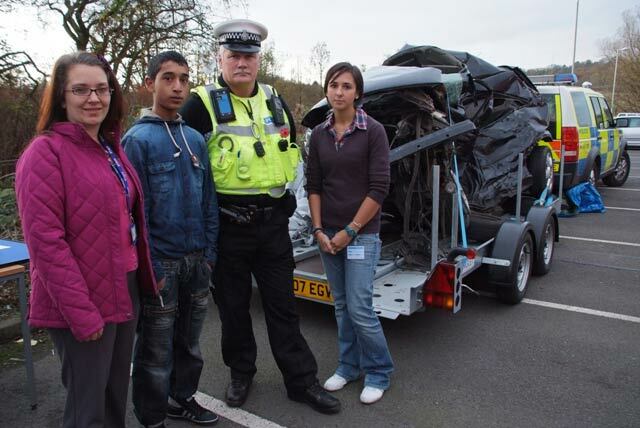 Afterwards they were invited down to the College car park to see the wreck of a car, which was the end result of a tragic accident where a young driver lost his life. Although shocking to see, the parents of the young man who was killed in the accident were keen to donate the wrecked car to the project in order that the message that risks cost lives, was passed on to other young drivers. Rhiannon Leeds from Wasted Lives said, “Working with the students at Nelson and Colne College has been really insightful. The students were an asset to the College and really took on board the messages of Wasted Lives. The feedback received was brilliant and if the young people take the actions they have pledged, the College will help the roads to become a safer place for all”.